St. Patrick’s Day is a four-day public celebration that includes parades, music, food, and games. For Irish people living outside Ireland, Saint Patrick’s Day became a chance to celebrate their Irish identity and culture. “It’s very much a day by which the Irish put themselves center stage,” Cronin said. Many countries hold Saint Patrick’s Day parades. Famous monuments, including the Great Wall of China, the Colosseum in Rome, the Niagara Falls, and the Gateway of India in Mumbai will all be colored by green light for the day. 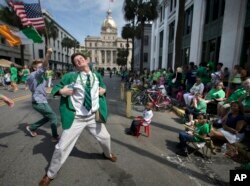 The U.S. is especially famous for its Saint Patrick’s Day celebrations. Many cities with large ethnic Irish communities, like Boston, New York and Chicago, hold parades and parties. Cities will also color local rivers green for the day. Cronin says that the worldwide popularity of Saint Patrick’s Day has helped the Irish government, which uses the holiday as a form of diplomacy. “So what you have is this quite remarkable day where literally over much of the globe, everybody, whether they’re Irish or not, the one thing they do know is the 17th of March is Saint Patrick’s Day. And for a small island of 4.5 to 5 million people it's quite remarkable that they have that kind of soft power." However, Cronin says many modern Saint Patrick’s Day traditions were invented by the Irish in America. In the U.S. on Saint Patrick’s Day, it is common for Americans to drink green beer or eat corned beef and cabbage. 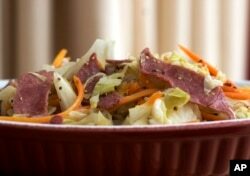 Sweet-and-Sour Cabbage With Corned Beef is seen in this Wednesday, Feb. 13, 2008 photo. “You could walk around the streets of Dublin all day and not find any corned beef and cabbage,” he said. Neil O’Flaherty, an Irish citizen now living in the U.S., agrees. Growing up in a small town in Ireland, O’Flaherty remembers celebrating Saint Patrick’s Day much differently than it is now. "Back then, for Catholic families, it was the day you had to go to church, you were required to go to Mass on that day. It had much more the feeling of a religious holiday than a public holiday." O’Flaherty said that he was surprised to see how much Saint Patrick’s Day in the U.S. has become linked to drinking lots of beer or other alcoholic drinks. 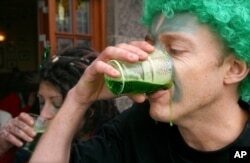 Contestants drink green beer at the first stage of the annual 3 legged race, on St Patrick's Day in Copenhagen, Denmark, Thursday March 17, 2005. However, there are some Irish connections between drinking and Saint Patrick’s Day. One tradition that does come from Ireland is called “drowning the shamrock.” Cronin explains that this tradition involved taking the shamrock that people wore all day, and placing it in a glass of whiskey or beer before drinking it. How do people celebrate Saint Patrick’s Day where you are from? We want to hear from you! Write to us in the Comments Section or on our Facebook page.